If you look anywhere on the Internet for inspiration, you will more than likely come across Pinterest. And if you haven't spent hours going through all of the pins, you need to sign up for an account now, but, be prepared to become addicted. All across Pinterest, you will find different ideas for garden markers, from rocks with chalk or paint on them, to wine corks on stakes. One of the most popular ideas that you will find for garden markers are stamped spoons. While these are a really cute idea, I just wanted something different. 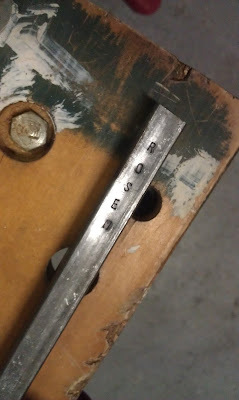 Loving the idea of stamping metal, I took a look at the Lowe's website, and found hollow welding tubes, and thought those would make the perfect garden stakes. Once I picked them up from the hardware store, I was told that because they were hollow, they would cut very easily with a hack saw, so I headed over to the tools section and picked up a hack/bow saw that came with a few different blades, including a very small blade that would work on metal. I used some clamps that I had to brace the welding tubes to the workbench that way they would be still when we cut them. 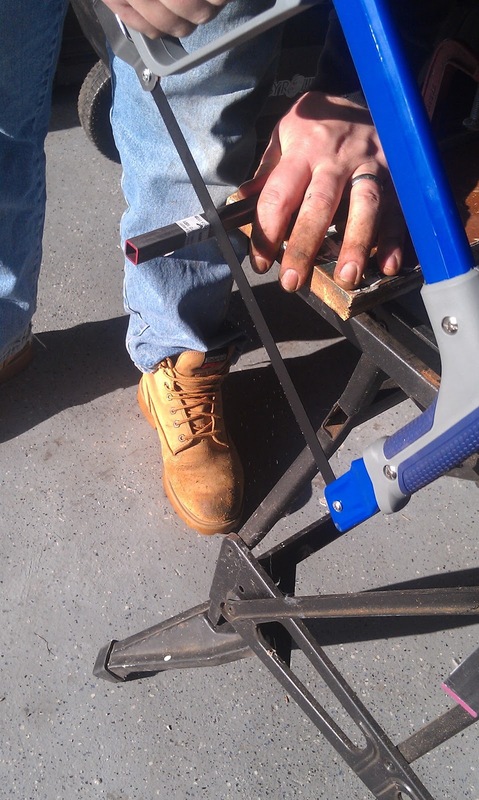 If you don't have any clamps, another pair of hands helping you hold down the tubes will work. Next, I had D help me saw the pipes off in 8" lengths. 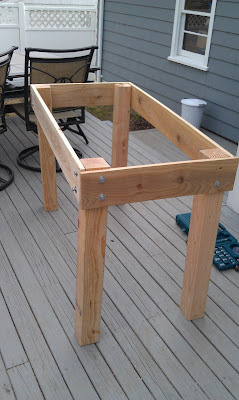 The sawing part wasn't hard, so if you don't have a guy around, you can definitely do it yourself. I just wanted to be able to get some pictures! If the ends of your welding tube are really rough after cutting, you can use some medium grit sandpaper to get rid of the sharp pieces and making it a little more smooth. Next, we got to the stamping part. 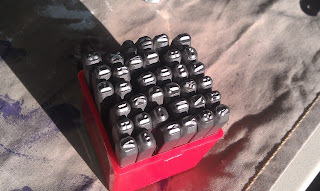 I bought a Metal Stamping kit, with 36 pieces, A-Z and 0-9, in all capital letters. I bought this set from Hobby Lobby, and it was over near the jewelry making section. They had a few different fonts and styles, but I liked the generic font the best. 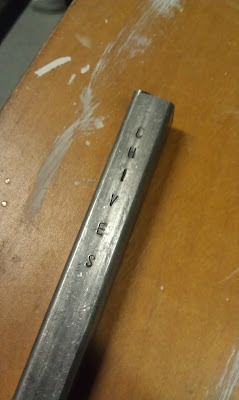 We took out the letters that we needed for the stakes, based on the herbs that I put in our planter a few weeks ago. 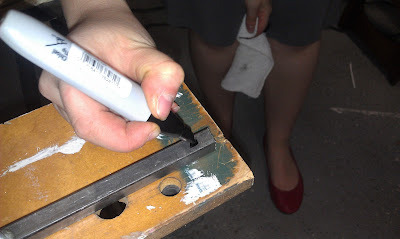 Next, we placed the stamp where we wanted the letter to show, and hammered it down. 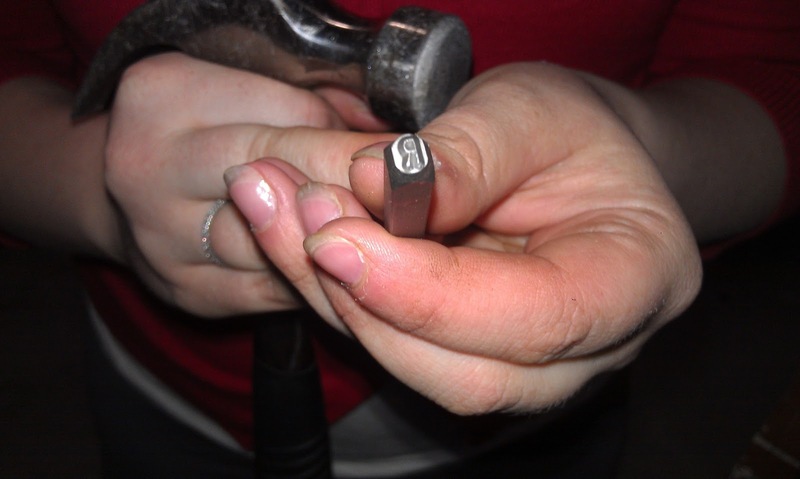 When making jewelry with these stamps, they recommend that you only hammer once and make it really hard. We hammered quite a few times, and I leaned the stamp to each side a few times to make sure that the entire letter was going to show up on the tube. 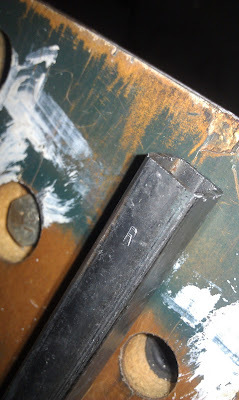 Make sure that you are absolutely positive that you have hammered hard enough for the letter to show up, that way you don't need to worry about lining the stamp back up with the imprint a second or third time. After hammering your letters in, you will want to go over them with a black permanent marker. Make sure that you get the marker in all the little grooves of the letter stamps. Let the marker sit and dry partially, then with a dry cloth, lightly wipe off the excess marker, leaving the color in the grooves of the stamped letter. Repeat the stamping and coloring process until you have all of the letters you want on your garden stake. As you continue, you may need to go back over some letters with the marker to make them a little darker. 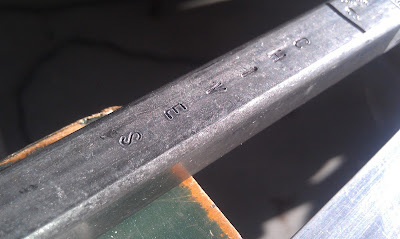 Once all of the letters in the name of your plant have been added to the welding tube, make sure they are colored in, and show nicely on the metal. 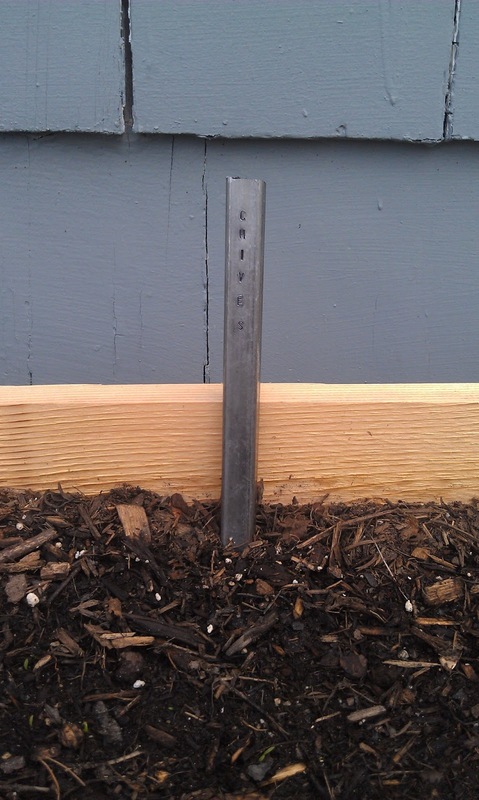 Now, you are ready to add the stake to your planter or your garden! I am so happy with this project, and so glad that it is something different from what you typically see around the Internet! I just can't wait to see how they look once my plants come in a bit more! On Sunday, D and I took a trip up to Massachusetts with my MIL to pick up a lamp from a family friend, who we will call F. F contacted D's mom about having a lamp that she was looking to sell, and before she advertised it more, she wanted to know if we were interested in it. 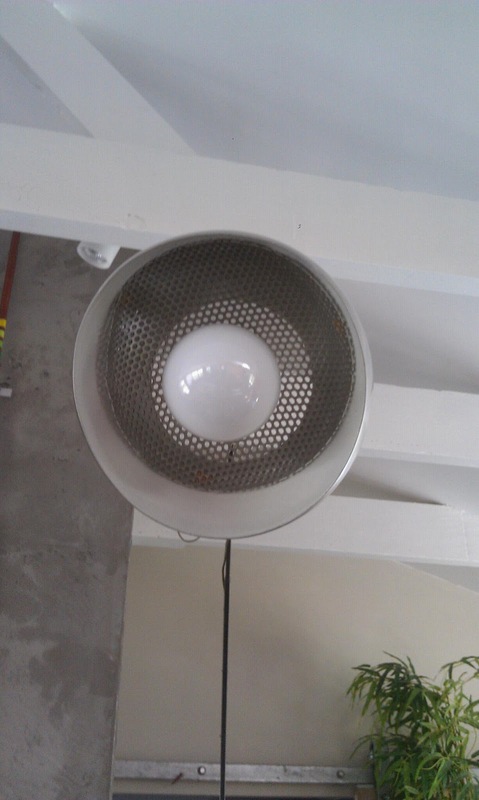 We were told what the lamp looked like and after talking about it, we decided we would take it! We took the hour and a half drive up to Stow, MA, and after taking F out to lunch to thank her for the lamp, we loaded it up in the car and took it home. Now, you may be thinking, you drove over an hour just to get a lamp? Well, this isn't just any lamp. This is an original Arco lamp from the 1970's! This lamp belonged to F's mom, and was purchased new in the 70s. F had it in her house for a long time, but after purchasing and finding some other items, she no longer has the space for it. After looking at the lamp, I knew that choosing to take this lamp was the right decision. Everything about this lamp is perfect. The marble base is in great condition, and while the metal on the rest of the lamp is aged, it just needs a little polishing, and then it will shine and look gorgeous. 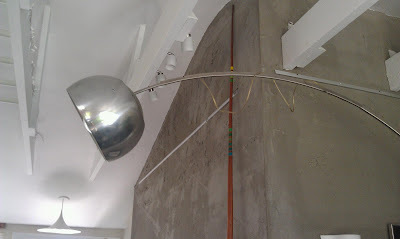 On the way home, we decided that this lamp will look perfect in the family room. If you remember the family room design, I think that instead of putting a table lamp on the white metal table between the couch and the chair, that we will put the base of this lamp in the corner behind the chair, and let it hang over the little table. For right now, the lamp is being stored in a closet, but I can't wait to get this room put together! This is going to look spectacular!!! 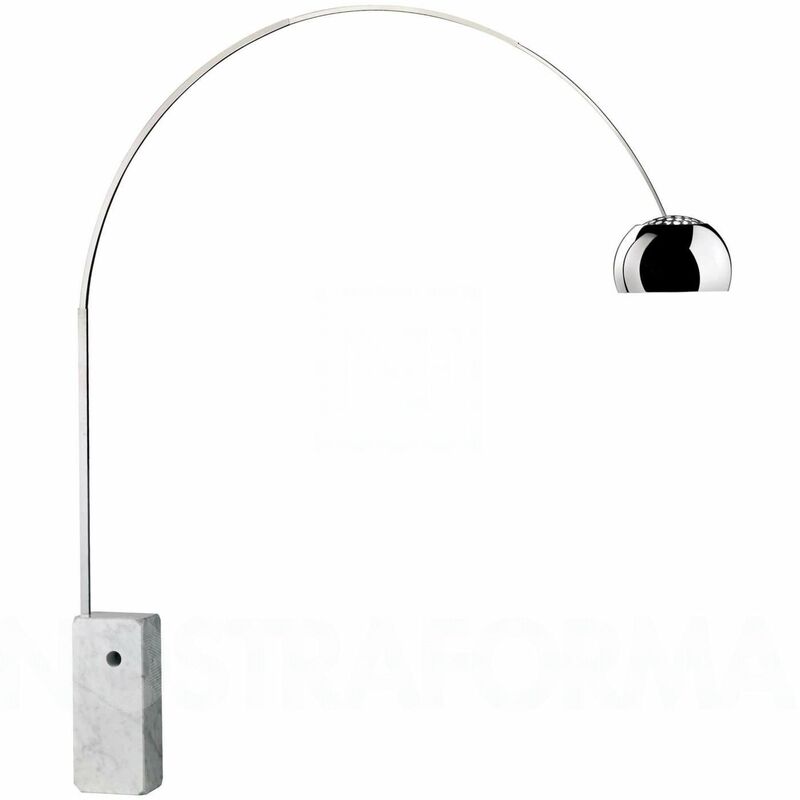 What do you think of Arco lamps? Do you have one in your home? Before I get to my garden woes, I want to say "Hello!" to all the new readers coming from ICLW! This is my first time participating, and while I'm not blogging about what most of the participants are, I hope that you find some interest in my topics and tutorials! I'm a newlywed, just married to my husband in October, after being together for seven years. We bought a house in the Fall, and are getting used to the trials and tribulations of home ownership. I'm a big-time DIY enthusiast, sharing my tutorials and home ideas here on my blog. If you're looking for more information, check out my bio above, and you can recap our beautiful wedding and take a tour of our house too. Thanks again for stopping by, and looking forward to reading about your journey! Keeping on track with planting, this weekend, we decided to take advantage of the nice weather and spend some time outside. 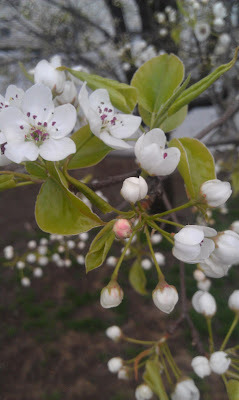 When we woke up on Saturday morning, I looked out the bathroom windows to see our pear tree blooming! When we first looked at the property, Google Maps had flown over for aerials in Spring, so the tree in back yard had white flowers on it. It took us a while to figure out what type of tree it is, but it's a non-fruit bearing pear tree! We have been looking forward to seeing the tree bloom and flower since we moved in, so being able to see the delicate white flowers on the branches this weekend was great! 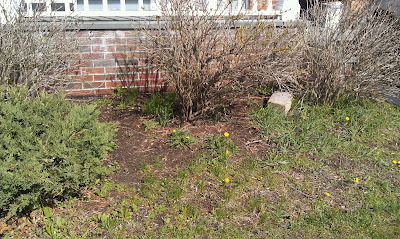 D and I have been waiting for the weather to get nice so we can finally get to work on the yard. Our neighborhood is absolutely beautiful, and the landscaping could not be more perfect. 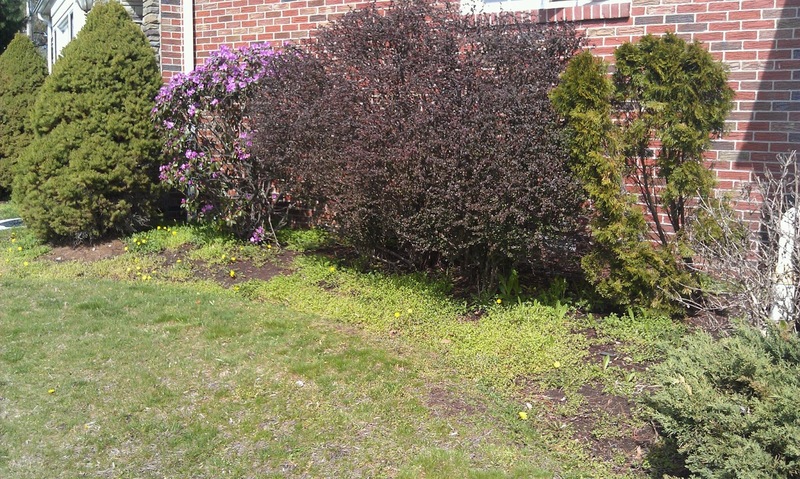 Since the area is so established, the homeowners have gorgeous mature landscaping and on a daily basis, there must be more than a dozen landscaping and yard care companies around taking care of the grounds of the houses. Since our house was not taken care of very well prior to us owning it, we are kind of the ugly ducklings at this point. 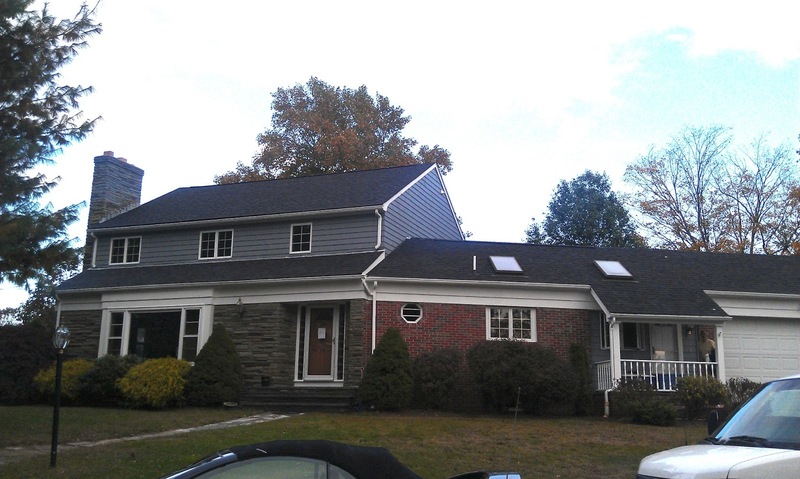 So, in an attempt to make the house look better, and be in better condition, we have already had the roof replaced, and the exterior painted. 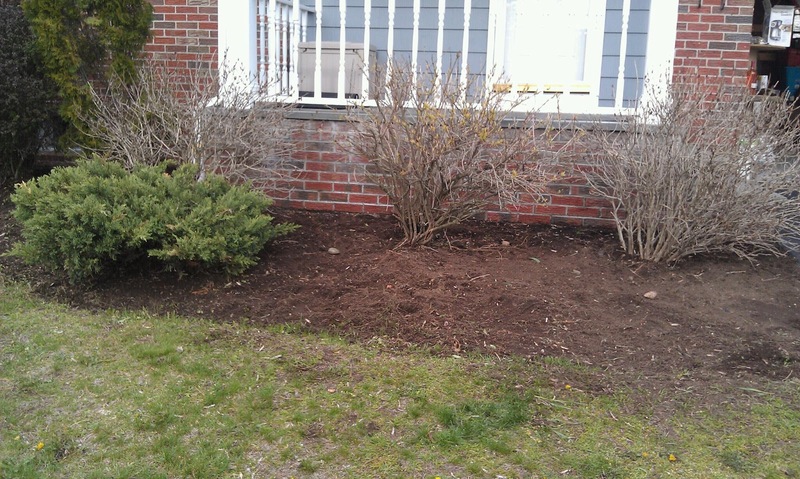 We've also torn up the front walkway, and plan to lay down a new one when the weather gets a little warmer. Now that Spring has sprung, it is time to clean out the gardens. The landscaping in the front is nice, but was really overgrown. When we first moved in, we trimmed things back that way branches and bushes weren't up against the house trapping the moisture, and so the shingles could be painted. We also tore out some big pieces that were dead and in the way. 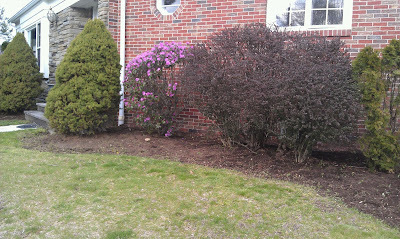 In the front, there are a lot of evergreens, but the problem was that nothing had ever been trimmed. After trimming some things back, and having two truck loads, two garbage cans, and three yard waste bags worth of yard trimmings and branches, we were finally able to get out there to do all the weeding. This is what we started out with. 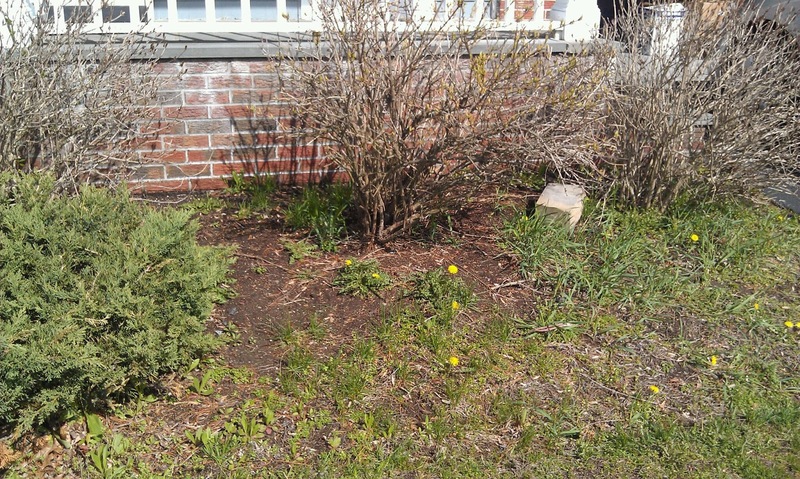 It looks like there is no defined garden bed, even though there is/was, and I think there are more weeds than plants, which is why it should be called a weed garden. Quite the amount of work ahead of us. I wasn't kidding when I said that nothing had been taken care of. There wasn't even a single piece of mulch in the garden beds. D and I set up with our yard waste bins, and got to work, and within fifteen minutes, there was already a huge difference. It took us about two hours total to get the front beds weeded, and that's with me being more particular and OCD than I should have been. But, it's finally at a place where we can go buy some plants and then put down garden mesh and mulch. I think we're going to go with a dark mulch, that way the attention goes to the plants in the bed instead of towards the ground. In terms of plants though, I'm not really sure what I want to do. 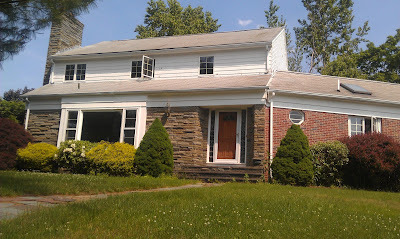 Any suggestions on non-invasive low-lying plants or flowers that would match with the landscaping that is currently around the front of the house? We do want to move some plants, but that likely won't happen this season. You may have noticed from the new link on my sidebar, and our Facebook page, or my Instagram, but my DIY Raised Bed Planter was featured on Instructables! This is a huge accomplishment, and I am SO EXCITED!! If you couldn't tell! So, I just wanted to pop on over here to announce that, and to tell you that on Sunday, I finally mixed up some potting soil, dirt, and garden mix, and planted some delicious herbs in my planter. My hands were covered in dirt, so I don't have any pictures of the planting process, but I must tell you that I did end up using newspaper (it was actually packing paper, which is just unprinted newsprint) and put about 6 layers in the bottom of the planter. So far, it's holding up great! I ended up planting Basil, Oregano, Parsley, Chives, Rosemary, and Garlic! These are my absolutely favorite herbs, so having them so handy will be awesome. And as of yesterday, I have my first sprout! EEEEKKK!!!! 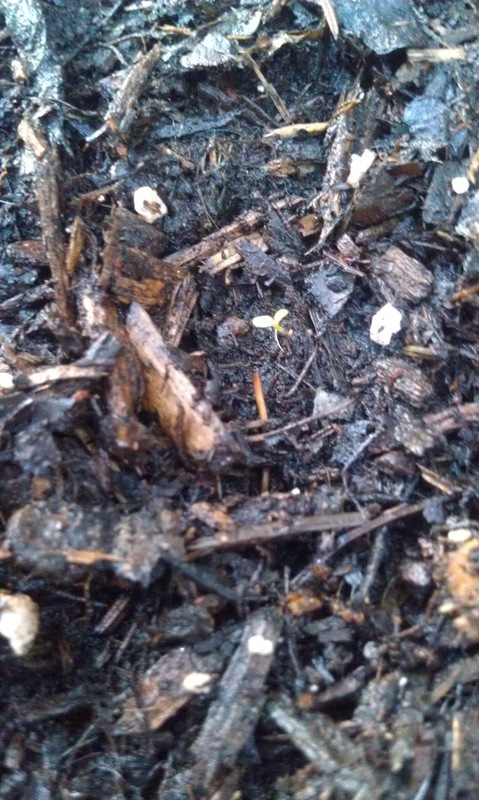 I can't believe that it only took three days for something to sprout! As you can see from the picture, it's almost microscopic, and my nose was practically touching the dirt while I was looking for evidence that I actually planted something, but it's still there! I'm really hoping that I start to get some serious progress on the growing front, and maybe if these start growing really well, I'll start building that second planter sooner than anticipated! 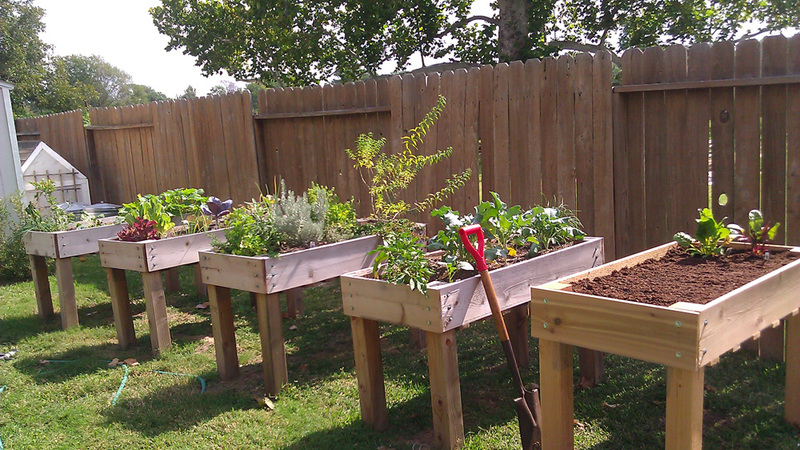 Have any of you built the planter, or had success with your herb or vegetable garden yet? If you happened to notice from the tours of our house, all of the door hardware throughout is brass. 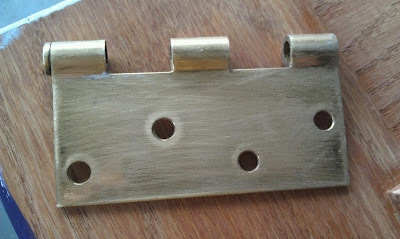 Brass is pretty outdated, and I know that neither D nor I want brass hardware in the house. Actually, if you asked D, he would say that he doesn't like it, but didn't really care to change it out right now. That's just how he is though. Anyways, we have a lot of doors in our house, so buying new hardware for the doors (hinges included) would cost well over $500. 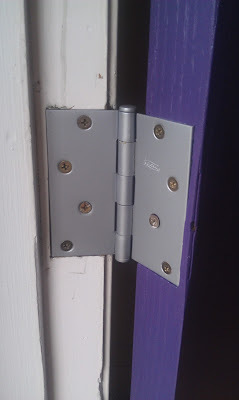 We just don't want to spent that kind of money on the door hardware. We would much rather save that for our future kitchen renovation, as I'm sure most people would want to do. So, I decided that I would make this into a DIY project, and spray paint the hardware. This will be a drawn out process, since I won't be taking down every single door in the house at one time, but it doesn't need to be done immediately, since it's just a cosmetic change. 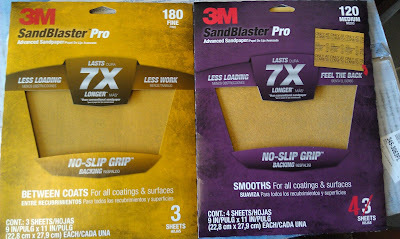 For this project, I bought fine and medium grit sandpaper. 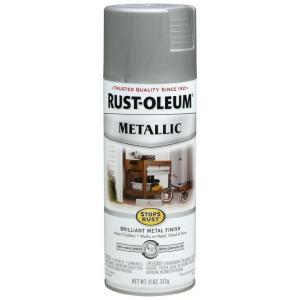 I also bought Rust-Oleum Matte Nickel Metallic Spray Paint. The first thing that I did was to sand down the hinges and the pins using the medium grit sandpaper. Unlike sanding wood, you don't really have to watch what direction you need to sand in. Make sure, though, that you get every nook and cranny that could possibly show on the hinges. Don't forget to sand the pins either. The only important part is the head of the pin, because that is likely the only part that will be showing, but just to be safe, I spray painted a little further down as well. 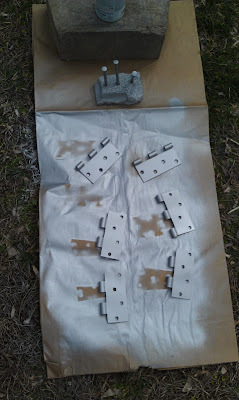 Arrange your hinges and pins on a surface that you don't care will get spray paint on. 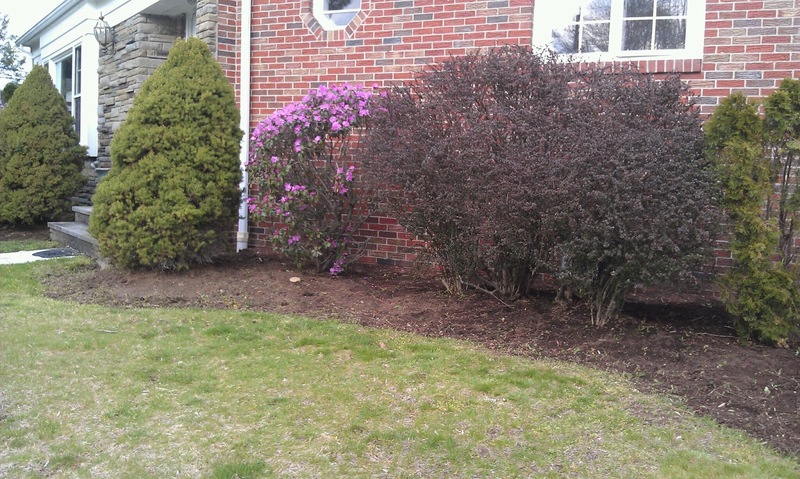 We used a yard waste bag, held down with a stone, and placed it on the front lawn. To help get the spray paint on the pins, I stuck them into a piece of Styrofoam that I found in the garage. You could also use planter's foam, or you could try to hang them upside-down from something too. 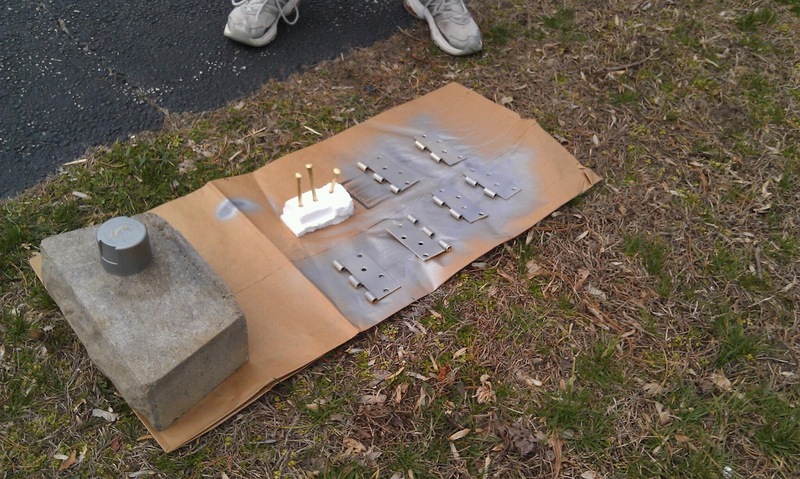 To paint them, you will want to spray the paint from side to side, about 6" to 12" away from the hinge. Make sure you don't spray on too much, otherwise you will see some drips and unevenness in the paint. Also, make sure that if you are working with edges on a product, you change the direction in which you are spray painting. This will help you make sure that you get everything covered. The spray paint dries very quickly, as in less than 10 minutes, so after we made sure it wasn't tacky anymore, we flipped the hinges over and painted the other side. Once both sides have been painted and dried, inspect them for any parts that may have been missed, and any drips. If there are any drips or imperfections, you can sand over them lightly with the fine grit sandpaper, and add another layer of spray paint. 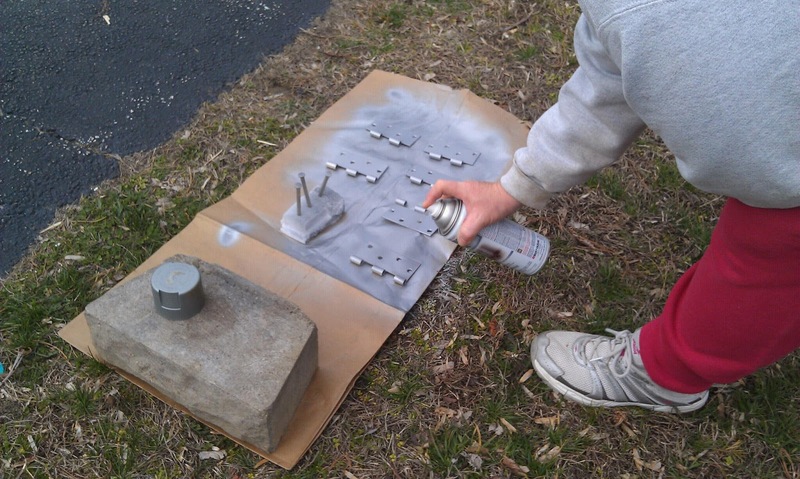 If you scratch them pretty hard, or are worried about them getting damaged, you could probably spray over them with a polyurethane spray paint. I haven't tried this, as it will likely make the paint a little shinier, and I like the matte look to the hardware. When they are completely dry, you can hang them back up on both the door frame and the door. It is easiest to put the 3 slot hinge on the door frame, and then the 2 slot hinge on the door. 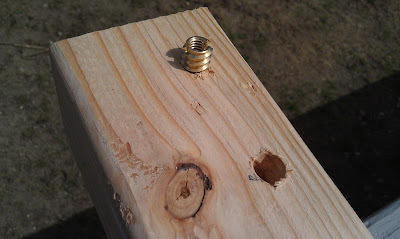 Attach your screws, which if they were also brass, you could replace with non-brass ones, or you could dab a small amount of spray paint on top of the screw using a Q-Tip once it is installed. 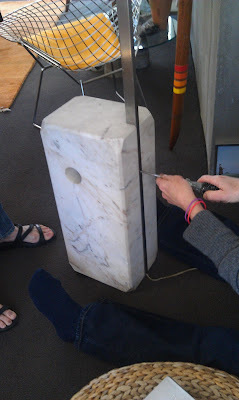 Then, insert the pin into the slots, and use a hammer to push it in all the way. You want to be careful when you are hammering the pins in, so I actually used the corner of a thick facecloth on the top of the pin so that the hammer didn't scratch or take off any of the spray paint. If you end up with any scratches, you can also use a Q-Tip with a small amount of spray paint on it to cover them up. And that's it! Simple fix for the brass hardware in your house! While it's not perfect, and it's more prone to scratches and damage in the future, it's a lot better than the brass, and a lot cheaper than replacing all of the hardware! Also, Rust-Oleum has other finishes too, like Oil-Rubbed Bronze, Satin Nickel, Chrome, and Aged Copper, so if you didn't want a Brushed/Matte Nickel look, you have other options. Is this something you would consider doing to your home? Have you already done this? How did your process compare to mine? While the title of this DIY suggests that I made a raised bed planter, what it doesn't tell you is how raised it actually is. This planter sits about 30" off the ground, and actually has legs on it. I know, right? That's really tall! So, this may make you wonder, "why do you need a planter that tall?" Well, I wanted one for a few reasons. The first, was that I was going to plant some herbs, but I can't use my backyard to plant them, because that is currently the home to four large dogs, which are not smart (or are they? ), and would probably eat all the herbs I planted. The second reason was that we have a lot of rabbits and other small creatures in our neighborhood that would probably eat my plants, so by raising them up quite a bit, I eliminate the chances of that happening. The last reason, was that I am planning on putting the planter in a temporary location, and will likely move it after my parents and my sister move out, so having a planter that can easily be moved was important. With all of these considerations taken, I found the plan for this planter via Ana White, whose website is amazing! She has plans for almost any project that you can think of. I took a trip to Lowe's on Saturday, the same day I got all the supplies for painting. Ana gives an excellent materials list, but there are some changes that needed making. Additionally, her assembly instructions are not as detailed as they should have been, and a lot of the assembly left me puzzled, so I will be including my DIY tutorial below. 2 - 1"x6"x8" Cedar boards. Select the boards that have the least amount of knots in them. You'll thank me later. 2 - 1"x4"x8" Cedar boards. Select the boards that have the least amount of knots in them. You'll thank me later. 1 - 1/4" Hardware cloth that is at least 24" wide. This can be found in the landscaping section. 16 - 2" Long hex bolts. You will likely find these in a bin in the hardware aisle. Make sure you check every single one you choose to make sure they are all the same. Some may have been placed there accidentally. 16 - Washers. Make sure that these fit around your 2" Hex Bolts. Make sure you check every single one you choose to make sure they are all the same. Some may have been placed there accidentally. 16 - 3/8" Threaded Insert Nuts. If you shop at Lowe's, these will be in one of the drawers of inserts in the Hardware section. This is what they look like. Miter or Table Saw that has the capability of cutting a 4"x4" post. Lowe's has a wood cutting service, as do most hardware stores. They can cut the smaller pieces of wood for you for an additional cost, but it's really cheap. They currently do not have the capability to cut pieces of wood larger than 3" thick. 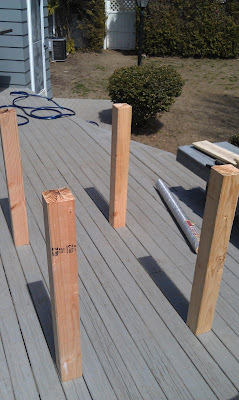 Legs - Cut the 4"x4" into 4 - 32" posts. Lowe's will not be able to make this cut for you. Their saws will not fit this size. You will need a miter saw or a table saw to make these cuts. Sides: Cut one of the 1"x6"x8" into two 48" pieces. Ends: Cut one of the 1"x6"x8" into two 24" pieces. 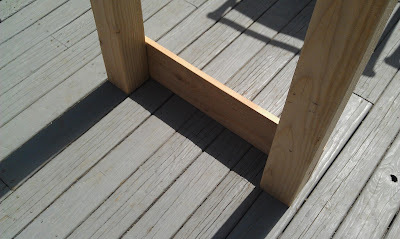 Bottom slats: Cut the two 1"x4"x8" into six 24" pieces. 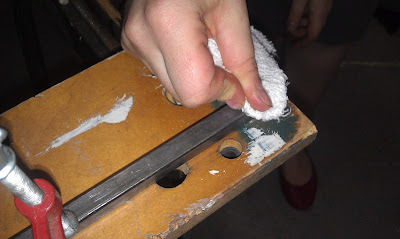 Bottom hardware cloth: Cut the hardware cloth into a 24"x50" rectangle. Step 1: Gather all of your supplies and tools. Make sure that you have everything listed above in the Materials list. These are the tools and pieces that you will need to put together your planter. Step 2: Cut your wooden boards. 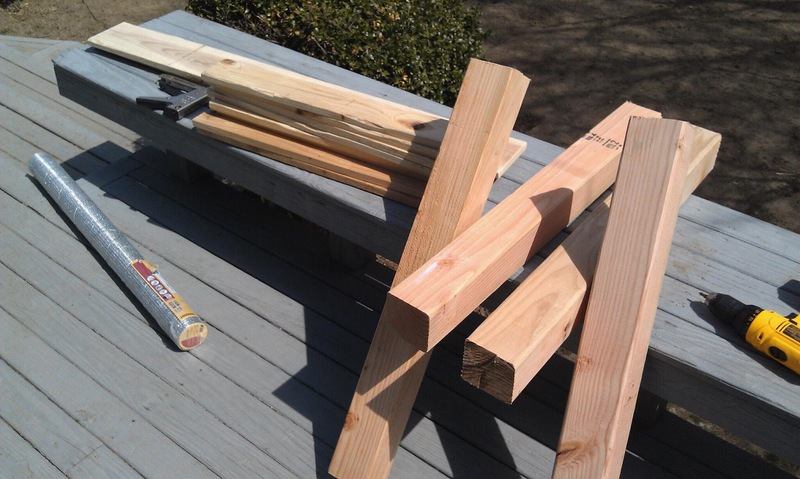 If you were unable to have Lowe's or your local hardware store help out with cutting, you will need to make the cuts to your wood before starting any other aspect of the project. Make sure you remember the golden rule of carpentry - measure twice, cut once. Step 3: Sand down the corners and edges of your wood. You don't want to get splinters when you're working in your garden, so spend some time before you start drilling and sand down the pieces of wood. Spend extra time on the surfaces that will be showing, as you won't want any snags or large pieces sticking out on those. I used medium grit sandpaper, and sanded down the edges and the flat ends of all my boards, but not on the 4"x4" posts. If you'd like to do those too, feel free. My saw didn't leave anything sharp, so I didn't feel the need to do that. 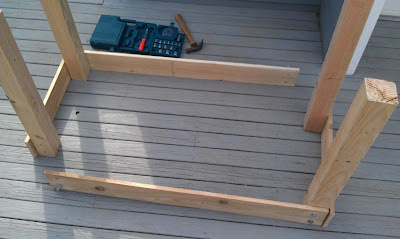 Step 4: Layout your planter. 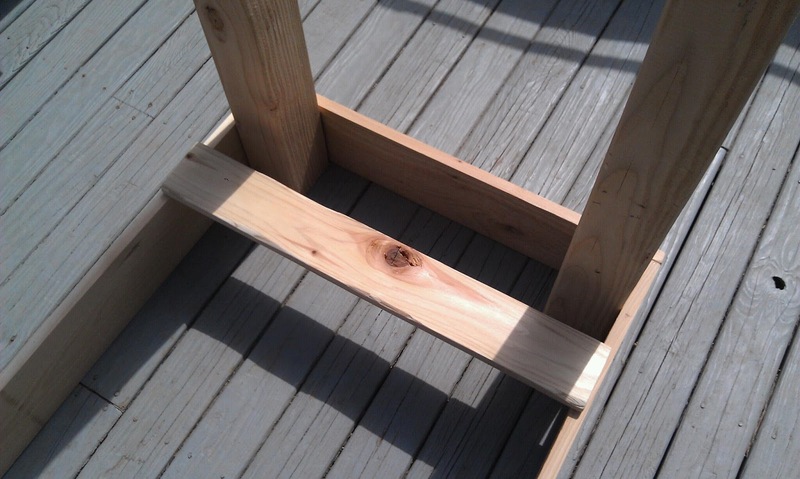 On a flat and level surface, lay out what your planter would look like if it was placed upside-down. This will help you figure out if you have enough space to work, and how the pieces will fit together. 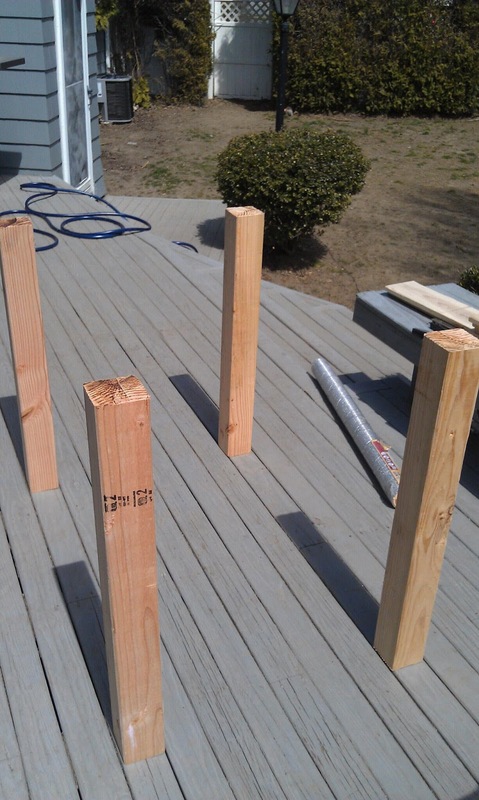 Start with the 4"x4" posts, and stand them up on one edge. Your end boards will go against the two posts, on the outside. 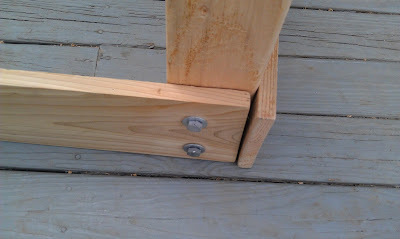 You will want the boards to go off the side of the post about 3/4" so that when you put the longer side boards up, they will meet at a 90 degree angle around the post. After you have the side boards up, make sure that your width is accurate by placing one of the bottom support 1x4 pieces across the bottom to make sure they fit. Repeat this step on the other side of the planter. Step 5: Measure your drill holes for your posts. 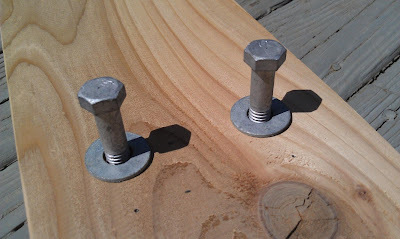 Since you will be using 2" Hex Bolts on the post, you will need to stagger the holes that you drill so that they do not interfere with each other in the center of the post. Use your measuring tape, mark holes using your pencil at 1.5" and 4" from the bottom of your post, at 3" from the left side. 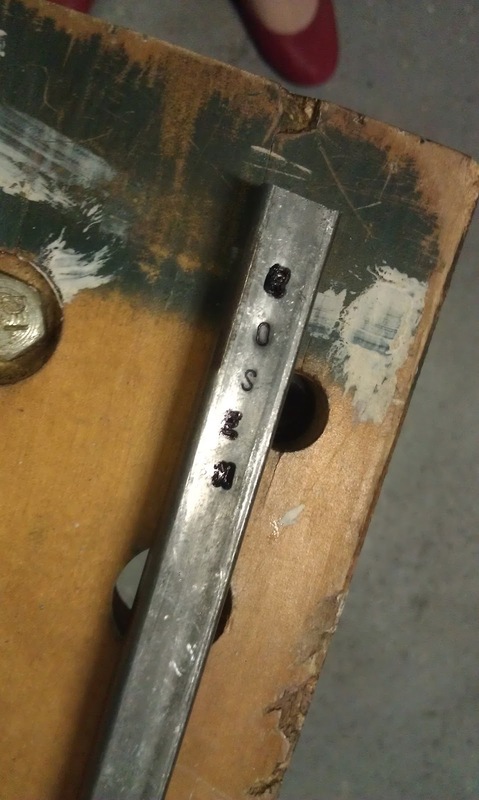 Rotate your post to the right, and then mark holes at 1.5" and 4" from the bottom of your post, at 1" from the left side. 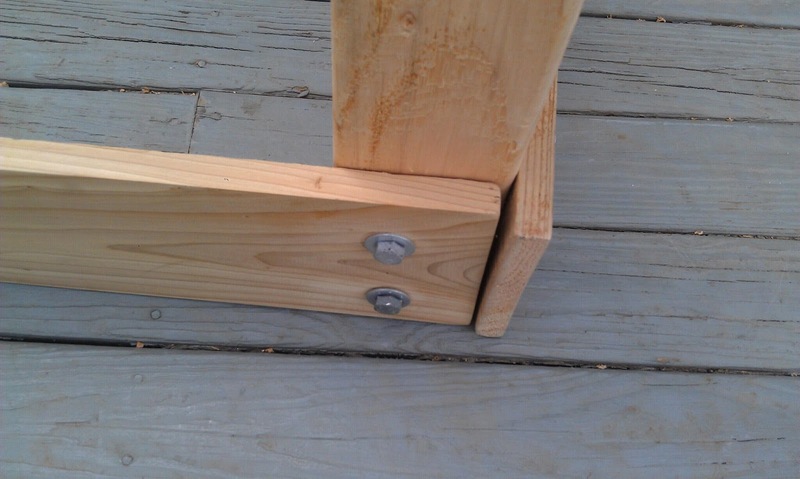 This will make sure that your screws do not touch each other in the center of your post. 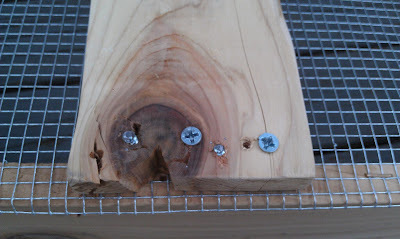 Step 6: Drill holes in your posts. 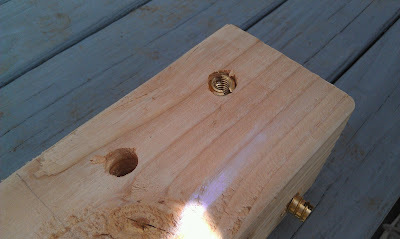 Using a drill with a 1/2" bit, drill holes where you marked the measurements. Your holes only need to be 1.5" deep, since your hex bolt will be going through another board as well. To help make sure you do not go in too deep with the hole, you can make a mark on the drill bit using a marker or a piece of tape. 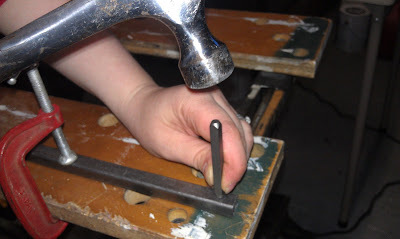 When drilling, make sure your board is held down securely, either by using a work bench with a clamp, or by applying pressure with your leg over a flat surface, like a bench. Drill straight down into the wood and try to keep it as level as possible so you don't break the drill bit. For every hole that you drilled into your posts, you will need to add in an Insert Nut. These will help make sure that your hex bolts stay in securely. Using a large flat-headed screwdriver, manually screw the insert nuts into the holes. Make sure that they go in straight, and screw them into the wood until they are flush with the surface. Step 8: Measure your drill holes for your side boards. First, measure the holes for the long side boards. Using your measuring tape, mark holes using your pencil at 1.5" and 4" from the top of the board, at 3" from the right side. Make sure you mark the holes on the side of the board that will be showing on the outside of the planter. For the shorter side boards, mark holes at 1.5" and 4" from the top of the board, at 1.75" from the right side. 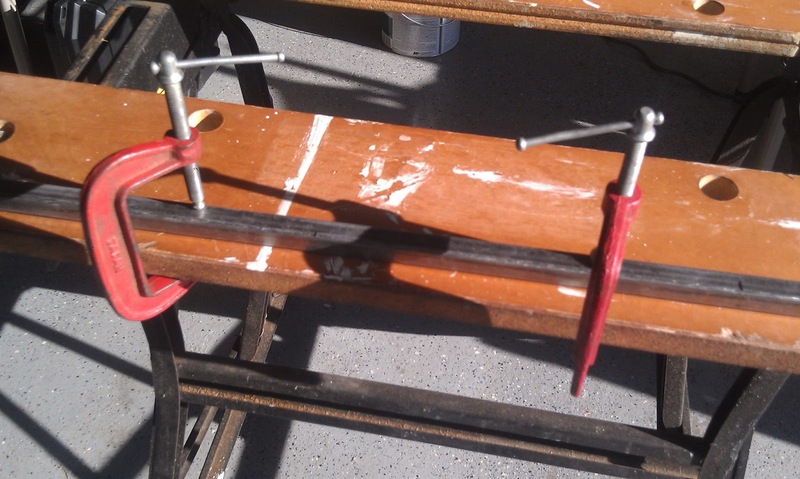 The reason for the extra 3/4" is because the short boards have a slight overhang from the side of the posts. Make sure you mark the holes on the side of the board that will be showing on the outside of the planter. Step 9: Drill holes in your side boards. 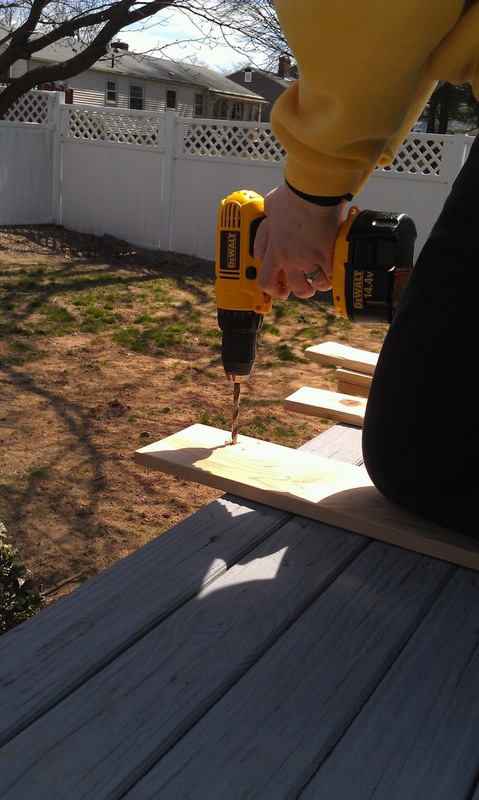 Using a drill with a 1/2" bit, drill holes where you marked the measurements. 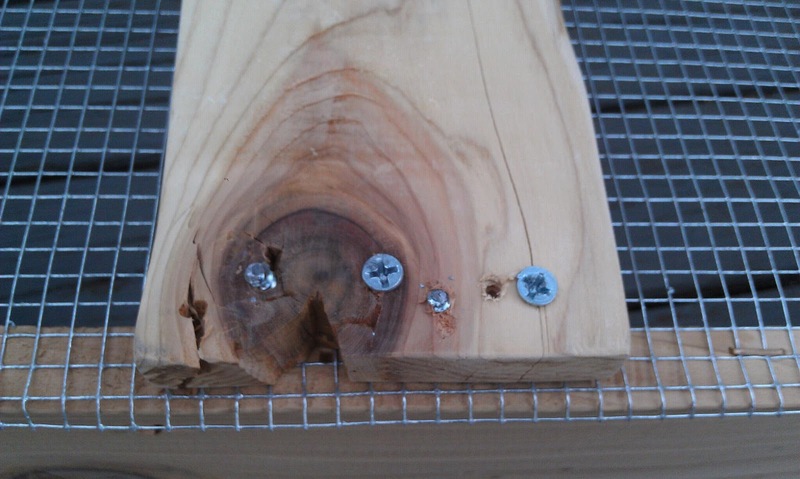 Your holes will need to go all the way through these boards since the hex bolts will also be going into the posts. Make sure you drill the holes from the side of the board that will be showing on the outside of the planter towards the side that will not be showing. This will help prevent the board from splintering on the side that will be showing. Step 10: Check your hole placement. Line everything back up, like you did in Step 4, and make sure that the holes that you drilled in the boards match up with the holes in the posts. This is the most difficult part of the planter. Chances are, that your measurements will be slightly off, so you will need to make the hole a little larger to accommodate that. Don't worry about making the hole larger than the head of the hex bolt. You will be using washers between the board and the bolt, so as long as the hole in the wood isn't larger than the washer, you will be ok.
Keep checking the hole placement until they all line up. I had to make a bunch of adjustments to my holes too. You could avoid this issue if you had clamps or vices and could put your post and board together and then use a drill press to drill through both boards. But, chances are that you don't have one of those. 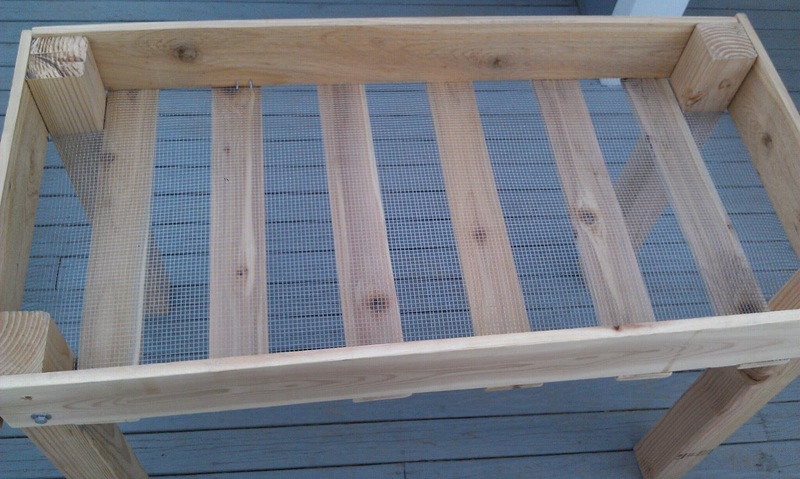 Step 11: Attach your hardware through the side boards. 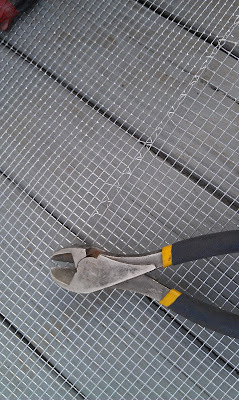 Once your holes line up, start screwing in the hex bolts using a hex wrench. Make sure you put a washer over the bolt before you start twisting it into the side boards. Don't put the bolts through all the way. You want them to show through to the other side a little bit, but you also want to be able to have enough space on the bolt to thread them into the posts. Step 12: Attach the side boards to the posts. 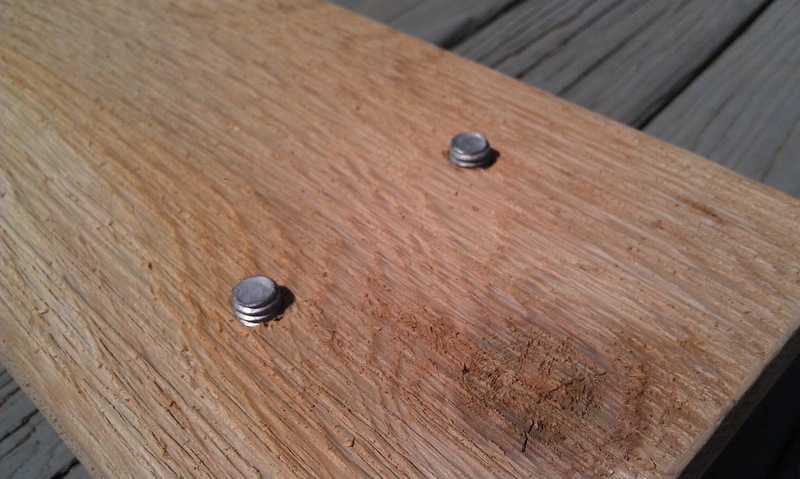 Once all of your side boards have hex bolts and washers on them, start attaching them to the posts. It is easiest to both side boards to one post, then do the post that is diagonally opposite, so you end up with two "L-shaped" pieces of the planter. Once you have the two "L-shaped" pieces put together, you can attach the longer side boards to the remaining posts. When all of your bolts have been tightened, flip over the planter, and check everything for sturdiness and for whether or not it is level. Just be mindful that you likely won't get everything to be perfectly level - that's ok. If you need to straighten out the legs a bit, loosen some of the hex bolts, and move the legs around, then tighten everything one last time while it is standing on the legs. Step 13: Cut your hardware screen. 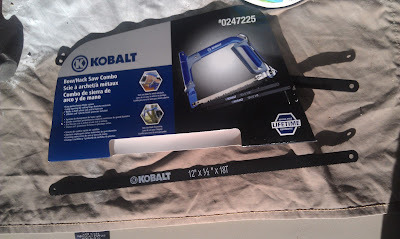 Using a pair of wire cutters or heavy duty shears, cut a 24"x50" rectangle from your roll of hardware screen. The metal is very sharp, so use caution when cutting this. 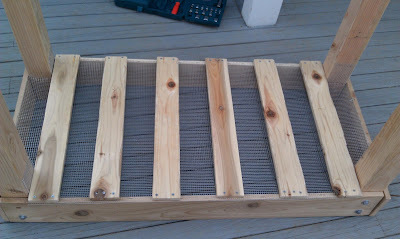 Step 14: Attach the hardware screen to the bottom of the planter. Flip the planter back over so that the legs are sticking straight up in the air. Making sure that your screen is centered vertically and horizontally, use your staple gun to staple the screen to the center of all four sideboards. Once the centers are done, you can continue along the length and width of the screen, attaching it to the underside of the planter. 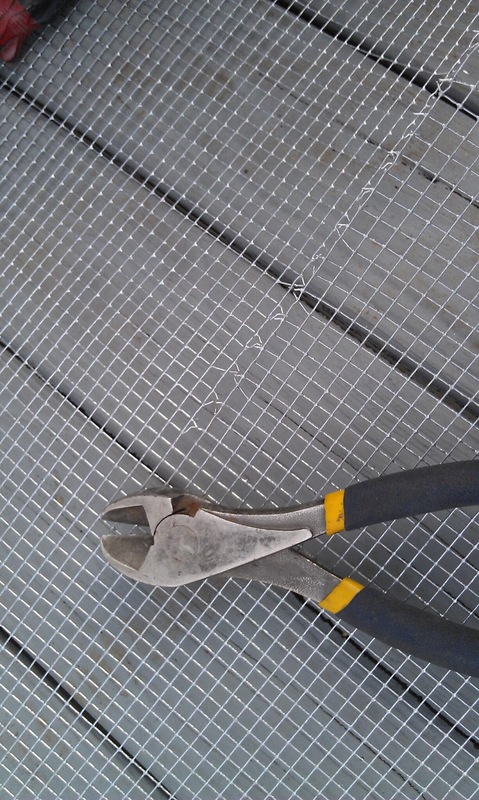 You will need to use your wire cutters or heavy duty shears to make a 4" cut at each corner of the screen so that it fits around the planter. I suggest that you don't remove the 4" piece, and instead, just staple it along the inside of the planter leg. 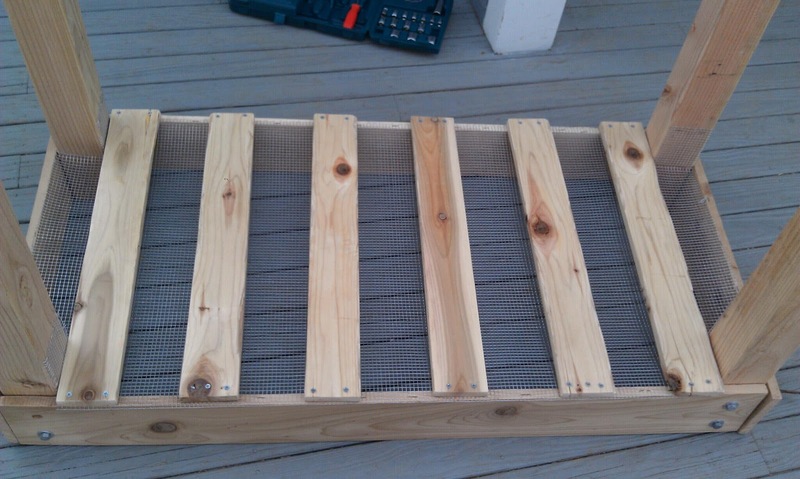 Step 15: Attach your support boards to the bottom of the planter. Lay out the 1"x4" boards that will be supporting the bottom. Space them out evenly, but you don't have to be neurotic and measure. Using your 1.5" galvanized screws, screw the boards into place. If your boards have knots at the end, try to avoid them. The knots in wood are always the hardest parts, and they don't like being hammered or screwed into. I found this out the hard way. 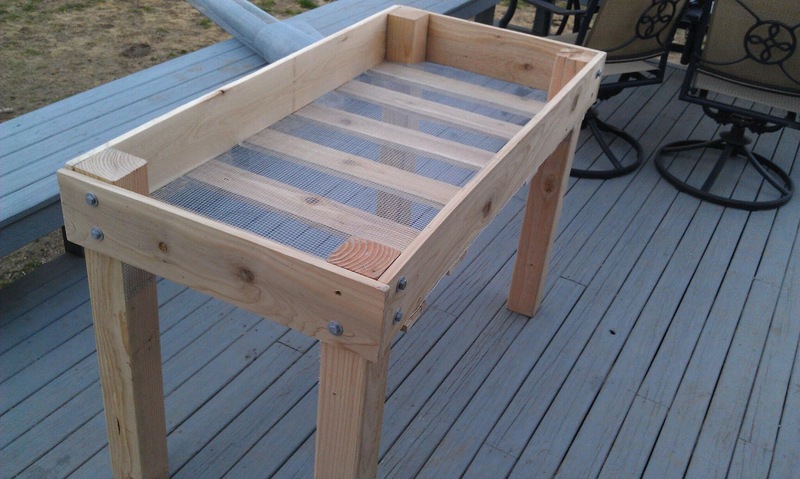 Flip your planter back over and admire your work! You're done! You have some options now as to how you want to keep the soil in. I plan on using newspaper, since it's biodegradable, recyclable, and cheap, but you may want to use something else, like planter liner, or coconut cloth. 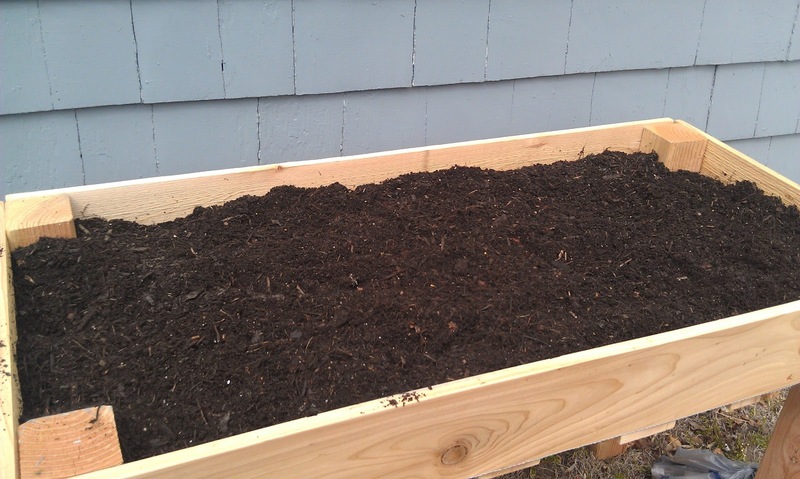 All that's next is to line it, fill it with some potting soil, and fill it up with delicious herbs! I'm so excited to have finished this project, and I can't wait to actually start using some of the herbs from our own garden! Surprise! Look what arrived on my doorstep!